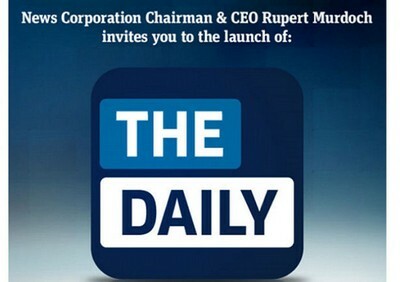 A Joint Venture between News Corp and Apple has resulted to the birth of ‘The Daily’, first-ever iPad digital newspaper, which goes on sale today. All iPad subscribers would be able to download the digital edition of the newspaper on their tablets which comes with a subscription of about 66p a week. Unlike other Apps, available for download from individual companies, The Daily would not be updated throughout the day with breaking news but would act as a single daily edition, more like your any other traditional morning newspaper. The Daily would be competitive than others as it includes no printing or distribution costs, resulting to lower price than actual printed formats but to make it successful, it needs somewhat around 800,000 subscribers. With the company eying more than 40 million units sold by the end of this year, the chances of succeeding this App is surely high. With the launch of ‘The Daily’, readers would be free of flipping pages on everyday basis on their ink-printed paper. Users rather would spend time on the digital iPad with access to sit anywhere and read. The Daily is to be launched at The Guggenheim Museum in New York with Apple being represented by VP of Internet Services, Eddy Cue.